Digest About Software, AI and Machine Learning | More productive with Visual Studio Toolbox. All in one code framework. More productive with Visual Studio Toolbox. All in one code framework. Code samples, code framework, how to find them with Visual Studio and bring them to the product. Senior Project manager Mei Liang show how to use code framework and what customer can do with it. Free centralized, customer-driven library. Online support services provide typical samples available for developers to help them resolve typical tasks. Frequently questions analyzed and provided as free code samples. You also can ask for a code sample from Microsoft. Over 600 samples can be found in 2 places: code-plex and MSDN. Just download visual studio extension from Tools menu Search Code sample inside Visual Studio. Just highlight code and right click then search code sample and it will give you highlighted API examples. The Microsoft All-In-One Code Framework is a free, centralized code sample library driven by developers' needs. Our goal is to provide typical code samples for all Microsoft development technologies and reduce developers' efforts in solving typical programming tasks. Microsoft All-In-One Code Framework, a code sample library provided by the Microsoft Community team. The Microsoft Community team monitors the MSDN forums, as well as other developer hangouts, and then creates code samples that address the issues developers run into. In this video, Mei shows us how to search for samples using the All-In-One Code Framework Sample Browser, which runs as a Visual Studio extension. She then shows us that the Sample Browser runs stand-alone! Good news for our viewers who are using Visual Studio Express. You can choose what version Visual Studio are you using 2008 or 2010 and download code sample. Almost all examples are available on Visual Basic, C++, and C#. Code snippets are existing pieces of code. All you have to do is type the snippets shortcut and Visual Studio writes the code for you. Watch as we first use a couple of snippets that ship with Visual Studio. Then, see how to use the Snippet Designer extension and create your own snippets. With this extension, you can highlight the code, right-click, and Export as Snippet. Download address: http://1code.codeplex.com/releases/view/68596. 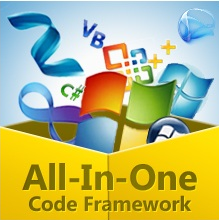 Summary A new release of Microsoft All-In-One Code Framework is available on June 19th. We expect that its 14 new code samples would reduce developers’ efforts in solving the following typical programming tasks. Alternatively, you can download the code samples using Sample Browser or Sample Browser Visual Studio extension. They give you the flexibility to search samples, download samples on demand, manage the downloaded samples in a centralized place, and automatically be notified about sample updates. If it is the first time that you hear about Microsoft All-In-One Code Framework, please watch the introduction video on Microsoft Showcase, and read the introduction on our homepage http://1code.codeplex.com/. Great sources for fashion news and fashion articles.